AMET Cruises – a new way to spend your holidays. In this article, I shall discuss about a new way of entertainment introduced in Indian Sea waters viz., AMET Cruises. You can know about the various holiday / vacation programs run by AMET Cruises. You can also plan your holidays with AMET Cruises. Please read ahead. AMET Cruises are the first Cruise Line for India. With AMET Cruise you can cruise into your next holiday. 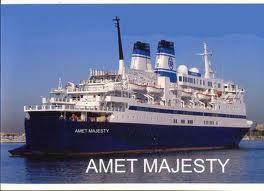 You can relax on the deck of Amet Majesty, India's first cruise liner, as you sail the seas in luxury. You can also dock at exotic ports in India, Sri Lanka, Maldives and Thailand and discover a whole new way to holiday. ·	It has relaxing massage centre & spa to rejuvenate your senses. ·	Cochin – Lakshadweep – Goa – Cochin. How to contact AMET Cruise? Hope you will find a new way to enjoy your holidays at Sea after reading this article.